Granny is Back and She's HOT! We have two new Granny sets. One is called Beauty and the Beach, and the other is called Granny's Secrets. I combined both of them for these samples. This is Florida Granny I decided. 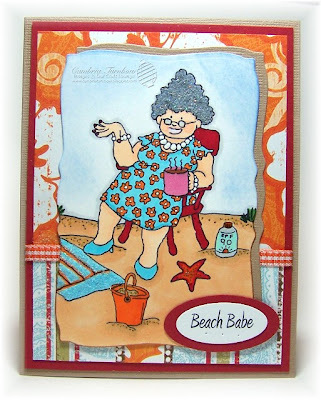 She's taking her coffee and her red chair out to be in the fresh air on the beach! The Granny's Secrets set has great sentiments for the inside too... but you'll have to wait until tomorrow to see the whole set! 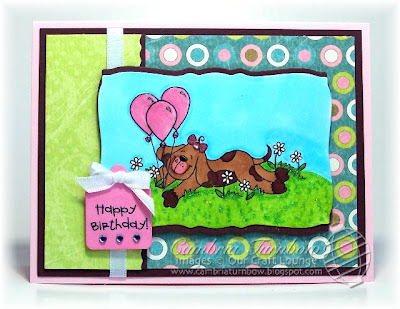 I used Bazzill cardstock for both card basis, and for the layer behind the main images. The red is Riding Hood Red from Stampin'Up! and the designer paper is from Creative Imaginations. It's double sided. 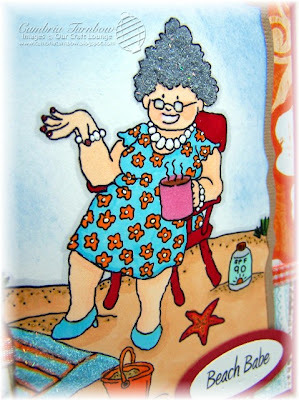 I'm still using all my new Nesties, both towels are covered with Sparkly Fluff... along with Granny's hair. Lot's of sparkle and raised dimension using my atyou Spica Pens and Sakura Glaze pens. Granny's pearls are extra white with the help of a Unibal Gel Pen. Have a super day! Thanks SOOO much for all the sweet comments and emails! I can't wait for tomorrow! Hey Stampers! So, what are your favorites from what you've seen so far? I have SO many favorites from this release... I hope you do too! 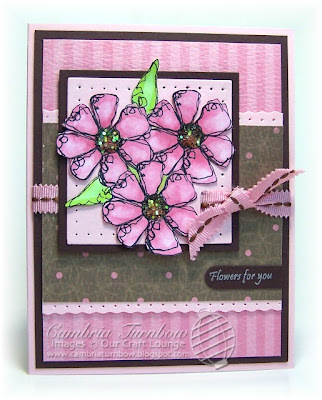 This is card is made with two sets... you know how I love to mix up my stamps. :) I started by doing the CC126 Challenge at SCS. I am also using the sketch challenge for the month at OCL. After making my branch, it seemed kinda bare, so I added the girlie owl from the Swingin' By set. LOVE that girlie owl! 24k Gold Sparkly Fluff is on the bee hive... but just in the lines. It's the perfect amount of sparkle and fluff. This second card I'm calling the backpack card. My friend Kisa told me you can take the largest Long Rectangle scallop Nestie and then fold it in half to make a little note card. How cool is that? Wouldn't this be fun to throw in your daughter's backpack, so she can hand it to a friend? You can write on the inside "Have your Mom call my Mom".....see the photo below that shows the inside of the card. Sparkly Fluff on their tummies. One has hot pink, the other light pink. The flower has a Kaiser Rhinestone in the center. The eyes are covered with Glossy Accents. That was my last piece of pink gingham ribbon, and not long enough for a knot, so I just tacked it down with a brad. All the pieces are Nestabilities, so it was easy peasy! Want to see more today? Here is the list of other sneak peekin' bloggers and I'll add more throughout the day. Thanks for stopping by! It's closer to Friday!! HUGE thank you to all my peeps for their help! Love ya girlfriends! Nice friends, Mice Friends... get it? This cute set is designed by Marianne Walker. It's just one of my favorites from the Summer Release. I love the bigger main image too. 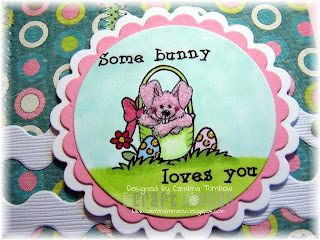 As you know, our sets come loaded with cute images and sentiments. You can see the entire set on Friday, when it's available, along with the rest of our Summer Release. Speaking of my dear friend Marianne... she was recently out visiting the girls at Spellbinders and she managed to bring me home some goodies! I HAD to get them out and play. Thanks M!! The big flower is a Nestability die called Dahlia. I used the Butterfly Impressabilities to make the cool embossed background, and I used the Labels Four Nestie for the sentiment. I used our Platinum Sparkly fluff on her ears and hands, and our Cosmo Crystal Sparkles for the centers of the flowers. 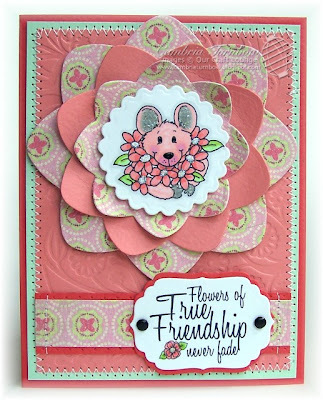 The flower really pops off the page with help from Jody's big circle foam dots, plus I gently bent up the petals. Paper: My Mind's Eye, Neenah White, Prism. Other: Quickie Glue Pen, Sparkly Fluff, Sparkles, Jody's Foam dots, Circle Scallop, Dahlia, and Labels Four Nestabilities, Butterly Impressabilities, Crafter's Tool Kit, Vintage Brads, Janome Sew Mini, Zip Dry, Scor-Pal, Sakura Glaze Pens. Thanks for stopping by! I hope you are enjoying the new release so far! This is going to be a fun week.... I'm so excited about all the things going on, I don't know where to start! I guess the beginning is good? I got an email a month or two before CHA from this girl named Debbie. She asked if we were adding to our team of illustrators. I said I'd check with my partners, and asked her to send us a samples of her work. I didn't hear from her... I thought maybe she changed her mind. At CHA I was SO thrilled to meet my friend Beth Silaika. We've been friends for SO long, it didn't feel like a first meeting, but I was SO happy to get a hug and see her beautiful smile in real life. Standing next to her was this tall little bomb. She said hi and shook my hand. Later, she told me she was "the" Debbie that emailed me! 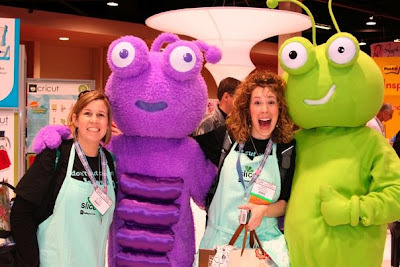 Every time they stopped by our booth they were full of energy and just having a blast. OMGosh, we had so much fun at the eP dinner... I just knew we'd be friends for a long time to come. I introduced her to Kimberly, and they chatted too. We all loved her and wanted to hire her on the spot... even without seeing her work! Shortly after we got home, we got an email from Debbie with some of her artwork. Oh my.. BOMB indeed! We were beyond thrilled that she wanted to work with us, and I've been having a BLAST getting to know her better. I know you will LOVE her designs. 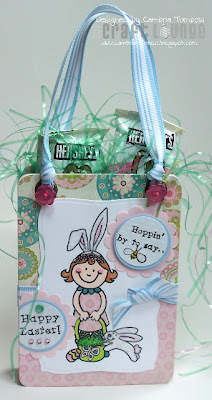 Hop on over to her blog and give her a big OCL welcome... 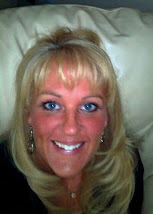 WElCOME DEBBIE CORBARI! 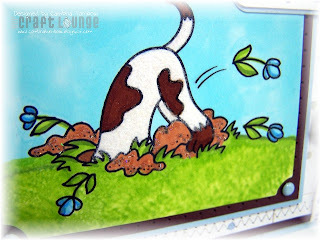 This week, we are showing sneak peeks of our new Summer Release! Keep your eye out! 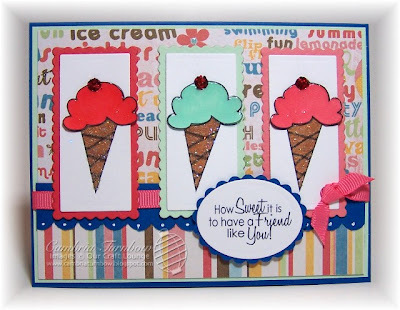 The above card is made from a set called Summer Sweets... just one of the fun sets designed by Debbie. On Friday, we'll be doing a big blog hop release, where you can see all the new sets AND have a chance to win each set! More news!! I'm so excited that my local scrapbook store Memories of Time will be carrying the ENTIRE OCL line of stamps! The first shipment is available now! All the Sparkly Fluff will arrive later this week! 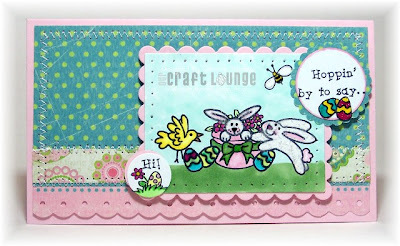 AND.... Our Craft Lounge will be at the store on National Scrapbook Day doing free make and takes! I hope you can stop by and stamp with us if you are in the North Bend/Coos Bay area. Thanks for stopping by! More sneak peeks are coming. Tomorrow I show you one of my favorite new sets drawn by Marianne! Hey Stampers! It's Friday! TGIF! I had a CRAZY week! Fun, but absolutely nuts. I flew down to San Francisco to help Marianne from Copic Marker with a couple classes. Oh man, did I have fun. I miss getting together with stampers. I met SO many cool peeps! Makes me miss my girls SO bad. Good thing I'll be teaching again soon.... more on that soon. I'm so excited I can barely stand it! Today's sketch is by Sharon. Come on down, you are the next contestant.... er... stamper to make a sketch for the weekend! Snort... can you tell I'm just a tad tired? Paper: My Mind's Eye, Chocolate Chip, Pink Pirouette, Neenah Classic Solar White. Other: Nestabilities, Big Shot, Jody's Foam Dots, White Satin Ribbon, atyou Spica Pens, Appletini Sparkly Fluff, Quickie Glue Pen, Kaiser Rhinestones, Sakura Black Glaze Pen, Zip Dry, Purple Cow Cutter, Scor-pal. This weekend, my friend Kisa came over and helped me prepare some things for my trip to San Francisco Tuesday. She shared this card with me. 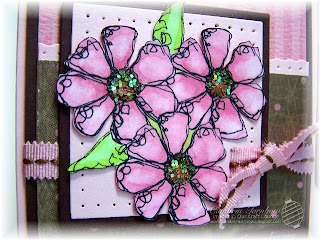 I was SO inspired with what she had done with Whispy Blooms, and bedazzled how she used our new Chunky Sparkles for the centers. As soon as I check out Jamie's gallery, I was off to my desk! 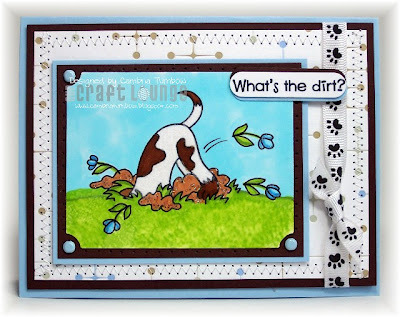 I chose this card from Jamie's awesome gallery to CASE. 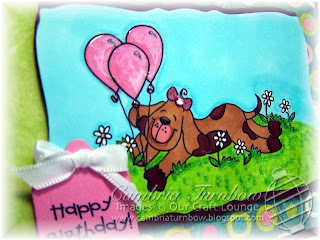 I changed the stamp set, the designer paper, ribbon and colors. Paper: My Mind's Eye, Pink Pirouette, Chocolate Chip, Neenah White. Ink: Ranger Soot Black, Copic Markers, Whisper White. Other: Crafty Sparkles Chunky Crystal, Zip Dry, Square Nesties, Slot Punch, Crafter's Tool Kit, Purple Cow Cutter w/Deckle Blade, Word Window Punch, atyou Spica Pens, Ribbon (unknown), Scor-Pal. Hope you had a great weekend, enjoy your Sunday! Thanks for stopping by! Hey Stampers! Wow... I've miss you all! Sorry I've been MIA. It's been beyond busy at my house. 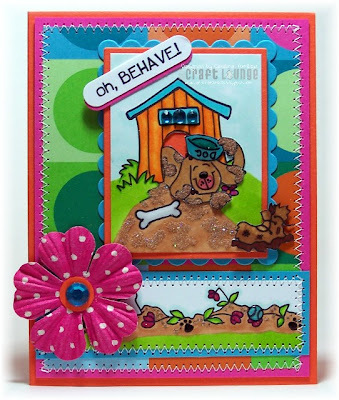 Today is Lori's turn for the sketch... please head over to her blog to check it out! I hope you can play along with us! This is Pat the Bad Dog. He's not really bad, just mischievous. He's got Crafty Sugar Fluff on his body, and Sparkly Brown Sugar Fluff in the dirt. Which are both available at OCL! Whoo Hooo! I'll show a short tutorial soon on how to use these fun new products. It's super easy if you have a Quickie Glue Pen! Check out the rest of the sketch team, I know it will be a treat! Paper: Reilly Wiley Jacks (EK Success), Chocolate Chip, Bashful Blue, Neenah White. Ink: Ranger Distress Black, Copic Markers, Blending Solution. Other: Brads (SU! 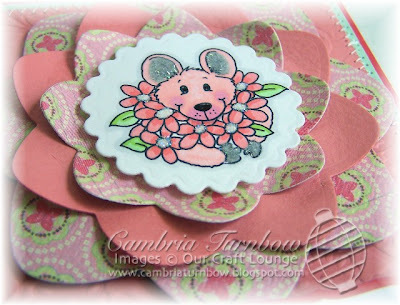 ), Large Label Nestabilities, Word Window Punch, Crafter's Tool Kit, Sparkly Fluff, Crafty Fluff, Quickie Glue Pen, atyou Spica Pens, Janome Sew Mini, Wash Cloth, Dimensionals, Paw Ribbon, Zip Dry, Scor-pal. Have a great weekend! Thanks for stopping by!! Well.. I guess it's a little late to wish you a Happy Easter! Sorry about that. I've been swamped getting the new release ready, making samples, and adding things to the OCL web site! Speaking of... all the Crafty Fluff, Sparkly Fluff, Crafty Sparkles and the new, AWESOME Crafty Clear Acrylic Blocks are all up on the site! I hope you had a great Easter. We had a very nice day. The rain waited until after the kids hunted for eggs, so it was perfect! eP has these cool regtangular coasters that I ordered awhile back... and they were calling to me! I covered two of them, front and back with My Mind's Eye Designer paper. I used Zip Dry Glue to attach them (love that stuff!). 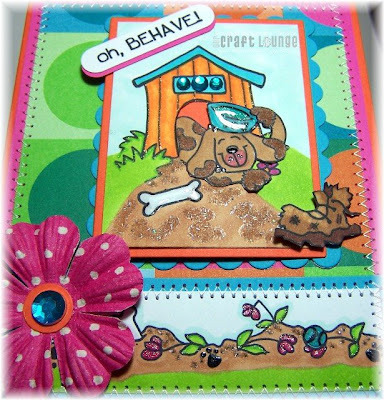 Added some holes in the top with my Crop-a-dile, then used Stampin'Up! Large Eyelets in the holes. I then cut ribbon, and tied them in knots, shoved the left over end through the hole, then added these cool blossom button brads. The inside part is a simple box I cut and scored using Primatics Ice Pink cardstock. SUPER EASY. I covered with Zip Dry, then stuck on the fronts. Of course the fun part about this project is the Sparkly Fluff I used on Anna Mae's ears, the bunny, and the Easter Grass in her basket. Of course there's a bunch of shine and and sparkle going on with help from my atyou Spica Pens too. All the coloring is done with Copic Markers, and her dress is paper pieced with the same cardstock from MME. 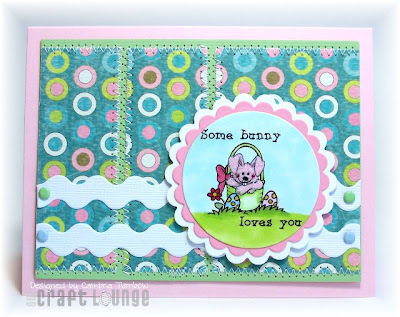 Stamps: Hoppy Anna Mae, Pea-nut Bunny (Our Craft Lounge). Paper: Penny Lane My Mind's Eye, Iced Pink Prism, Neenah White, Bashful Blue. Other: Striped Ribbon (SU! ), Large Eyeletes (SU! ), Slot Punch, Nestabilities, Scallop Punch, Circle Punches (SU! ), Crafter's Tool Kit, Crop-a-dile, Zip Dry, Kaiser Jewels, Blossom Brads, Sparkly Fluff, Quickie Glue Pen, atyou Spica Pens, Sakura Glaze Pens, Scor-pal. Thanks for visiting, and I'll be back to full blogging mode soon... promise! See you tomorrow for the weekend sketch! Hello everyone.... happy Monday! I hope you had a great weekend. Today, I'm finishing up some Easter images I had laying around. I need to get them on cards so that I can get them out in the mail. Actually... I know this is bad, but I don't get too many Easter cards sent out. But, my Grandma loves to send them and so does Averie. And wow, did you know Easter is this coming Sunday? It's also my Mom's birthday, so it should be a really nice day. My kids LOVE Easter. Beside the chocolate and candy they love the "Easter Egg" sandwiches. Paper: My Mind's Eye, Pink Pirouette, Neenah White. Other: Sakura Glaze pens, Sugar Sparkly Fluff, Quickie Glue Pen, atyou Spica Pens, Bazzill Cardstock Stips, Soft Suble Brads, Dimensionals, Crafter's Tool Kit, Nesties, Janome Sew Mini, Scor-pal. Happy Friday Stampers! This weekend’s sketch is by Mary Jo! Head on over to her blog to see the sketch. Thanks MJ! This was fun! 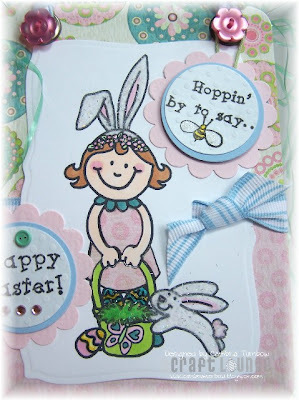 I used the stamp sets Hoppy Anna Mae and Pea-nut Easter Bunny. Both sets are on sale through April 12th at Our Craft Lounge. Both bunnies have Sugar Sparkly Fluff on them so they not only sparkle, but they are soft…..just how bunnies are suppose to be. 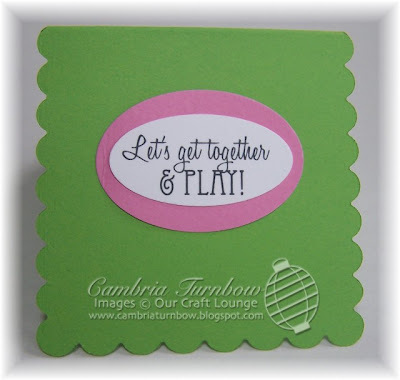 The designer paper is from My Mind’s Eye, the cardstock Pink Pirouette by Stampin’Up! I colored the images with Copic Markers and added extra shazam with my atyou Spica pens and Sakura Glaze Pens. The scallops along the bottom is actually the designer paper. I used Rectangle Nesties for the main image. Marvy Scallop Punch, plus 1 3/4 and 3/4 inch circle punches from SU!. Hope you have a wonderful weekend! Today, my baby turns 16! I cannot believe I have a 16 yr. old. We are off to the DMV so that he can take his driving test…. wish him luck! He’s SO nervous. He’s a very good driver, so I’m hoping he will pass and not be bummed out on his birthday. Tonight, he’s having a few friends over, so I’m sure they’ll be up half the night XBox’in. So… I need to hit the grocery store and stalk up to feed them all! :) Wish ME luck! I also posted another Sketch Challenge over in the OCL forums. This sketch is based on last month’s winner, Deb. This is her winning card, and this is the card the sketch is based on. Hope you can play along with us this month! This card is loaded with touchablility! Glassy Accents,Fluff, Sparkly Fluff, atyou Spica Pens…. and those wonderful Kaiser Rhinestones. I had so much fun putting it together! I cut out the hole of the dog house and then cut out Pat and stuck him inside.... well, his back end anyway. :) There is Glassy Accents on his dog dish, the ball and his bone. Paper: Dots and Dashes (retired SU! ), Pink Passion, Only Orange, Tempting Turquoise, Neenah White. Other: Brown Sugar Sparkly Fluff, Fluff, Glassy Accents, atyou Spica Pens, Sakura Glaze Pens, Kaiser Rhinestones, Janome Sew Mini, Scor-pal, Rectangle Nestabilities, Paper Flower (Prima), Quickie Glue Pen, Jody’s Foam Dots, Word Window Punch, 1/2 inch Circle Punch. Come join us from 10-1. OCl will feature its newest product, Sparkly Fluff!